Should I Buy a Truck with an Aluminum or Steel Roof? Roof strength is important in pickups as they can roll over. Aluminum has been found by the IIHS to be safer than steel. Steel makes people feel safe. Daredevils who dive in shark-infested waters use steel cages to keep the sharks out. Prisons use steel bars to keep the bad guys in. And if you’re a citizen of Metropolis, well, you’re protected by the man of steel. If you need to haul around super heavy material, you need a big strong truck. And big strong trucks are made of steel. Aluminum, like steel, is a metal. You buy aluminum at the grocery store in the bakery section. It comes in a roll. Aluminum is used to cover plates of leftover food to give to your guests as they leave a party. They also make soda cans, yogurt lids, and candy bar wrappers out of aluminum. Both steel and aluminum are metals, but the similarities end there. Or so it may seem. For years, pickup trucks were made from steel. It makes sense — pickup trucks do hard work. They haul thousands of pounds of stuff, they tow thousands of pounds of stuff, and they're expected to last a couple hundred thousand miles. But Alan Mulally, the retired CEO of Ford, and his engineering team said the truck industry was wrong, and that the future was in aluminum. For more than a decade, Ford engineers studied how to make an aluminum truck that was tough, rugged, safe, and good on gas mileage. Prior to his retirement, Mulally told Consumer Reports in February 2015 that “pound for pound, aluminum is stronger and tougher than steel.” Pound for pound, aluminum also costs twice as much as steel (believe it or not), so Mulally had more than a few critics when he bet the farm that the market would someday favor an aluminum truck. Mulally not only bet on aluminum, he bet that Ford’s most profitable vehicle, the Ford F-150 (800,000 units sold annually), would be adopted by buyers. The F-150 isn’t 100 percent aluminum, however. The frame is still made of steel, but the bed, side panels, and hood are made of “high-strength military-grade aluminum alloys.” While the phrase sounds impressive, what exactly are “high-strength military-grade aluminum alloys?” Answer: according to MetalMiner, an online resource for metal-buying organizations, it’s a marketing catch phrase. By using aluminum, the new F-150 is 700 pounds lighter than the steel version and that translates into a 25 percent increase in mileage. Now F-150s get about 19 mpg city, and 26 mpg highway. In 2013, the all-steel version of the truck earned 13 mpg city, and 17 mpg highway. The F-150 has been widely accepted by the marketplace, and as a result, Ford intends to integrate aluminum into its F-250 line in the next few years. The aluminum trucks also cost more to build than steel models, primarily due to higher material costs. As such, customers pay a small premium when purchasing an F-150. According to tests performed by the Insurance Institute for Highway Safety (IIHS), the Ford F-150 was the only truck to earn the Top Safety Pick rating in the large truck division, and the extended cab version of the truck received a “good” rating. The test simulated a vehicle hitting a tree, hitting a pole, and clipping the side of an oncoming car. All of the other trucks that were tested had problems with the the driver footwell area being crushed during crash tests. This suggests that drivers would suffer serious leg injuries in collisions. A natural concern among those who might consider an aluminum truck is its safety in the event of a rollover accident. The IIHS test concluded that the aluminum Ford F-150 had better roof strength than that of the steel-cab 2011 F-150. Roof strength is especially important for pickups, as 44 percent of all deaths involving pickups are due to rollovers. Roofs that aren’t built solidly cave in on impact, and the resulting force often ejects occupants from the truck. Should you buy a steel truck? Steel trucks will still be around at least until the end of the decade. In 2015, GM announced that it would begin building Silverados and GMC Sierras using aluminum. Industry reports indicate that Chrysler will transition its RAM 1500 to aluminum by 2019 or 2020. The question of whether or not to buy a steel truck will soon be moot. The industry is moving to meet federal fuel efficiency standards, and in order to meet those guidelines, manufacturers have to reduce the overall weight of the vehicle. With the lighter-weight benefits of aluminum over steel, many manufacturers are going to eventually make the switch. But for the next few years at least, you’ll still be able to find a truck made from steel. Whether or not you feel comfortable purchasing one is up to you. Q: How do I recline the rear seats? 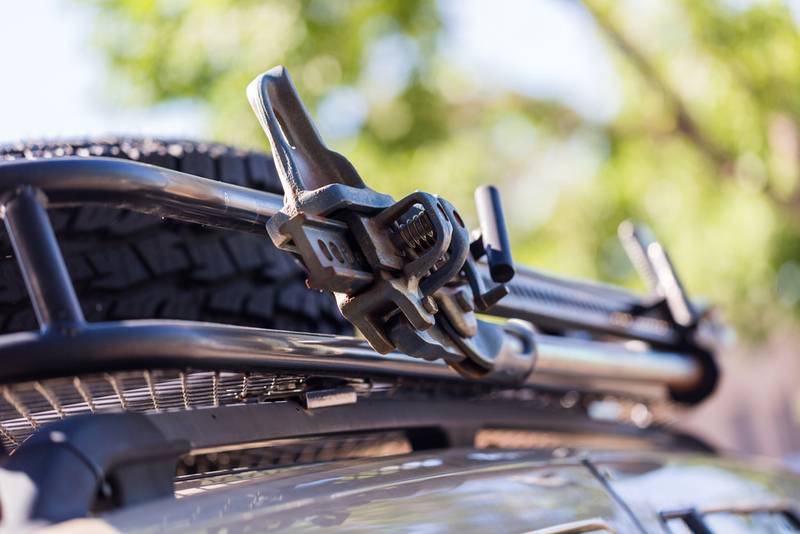 Q: How do you remove the crossbars from the roof rack?